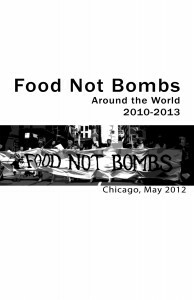 Food Not Bombs Around the World is a new zine created to demonstrate the diversity and strength of the idea and the movement known as Food Not Bombs in the 2010′s. Download it here to add to your literature table or for whatever else you feel like! Also e-mail us at swampzine at gmail dot com if you want us to mail you some copies. This zine is part of the Food Not Bombs Free Skool, which opens for summer classes in just two months! If you ‘d like to be a part of the Free Skool or want to help create more literature about Food Not Bombs, email us. I love your site! and I’d love to contribue some writing, if you can use it. I’m a published author (17 technical books on the finance sector, sadly…) and one in the works on finance and sustainability. I spent 30 years working for the ‘dark side’ of financial services and have only in the past 6 years – after an alcoholic breakdown and recovery – woken up to the reality of how toxic that can be, for the world as well as for one’s spirit. I am now trying to rebuild a career as a writer on issues from the environment to global povwerty – with special focus on the damaging role the offshore financial centres play in this (something I know a LOT about, and want to draw attention to ask me, please, and I’ll fill you in….!). I’m now Secretary of IoM Friends of the Earth, and an active permaculturist (just completed my permaculture design Certificate at a course near cairo, where I learned of your work) and also a trustee of the One World Centre, a charity in Isle of Man that teaches kids about the global impacts of what they do. I also write a localo weekly column on green issues – here’s a couple of example, in case theyre of interest. My email;’s catturner@manx.net and my phone ++44 7624 482077 – please let me know if I can be of any use!